This post is not about writing or reading or books. But it is about art and creativity and bringing the audience to the work and the work to the audience, which is in fact not really an audience but a key part of the work, simultaneously constructing it as they consume it and performing various other acts of deconstructive postmodernist discursive etcetera. People of Perth, this is awesome. And not just because you can – nay, must – get really, really wet in the centre of the city. But because, delightfully, while it’s about constructing walls, it’s at the same time about breaking them down, not just in water and rooms, but in people. 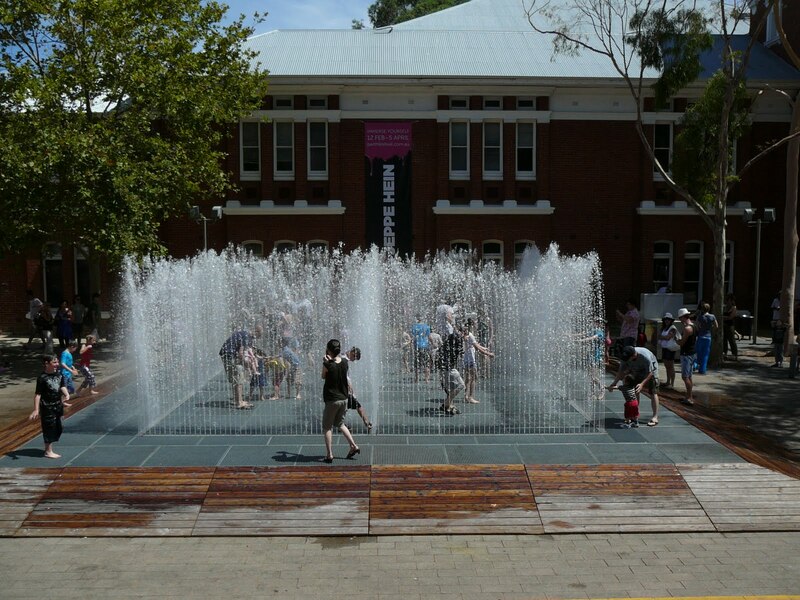 We stopped in yesterday, to the Cultural Centre outside PICA, just down the steps from the State Library, where Danish artist Jeppe Hein’s aquatic sculpture “Appearing Rooms”, is currently installed (though ‘installed’ seems the wrong word entirely somehow). We stopped past for a few minutes, just to check it out, to say ooh and ahh and I went and saw that Appearing Rooms thingy, kind of cool har har. Over an hour later, we left, all of us wetter than we had ever expected to be. And considerably more relaxed. It was fun being in the rooms, yes, but it was even more fun watching other people interacting with them. There were people who came prepared – in bathers, with towels. They clearly had some sort of insider information. There were people who came unprepared. Who came to see the sculpture but didn’t quite know what they were getting into. Who tentatively stepped into a room trying not to get wet, avoiding the jets as the walls shifted. Who almost unanimously, within less than a minute, were grinning and letting themselves get slowly wetter and wetter until they were soaked to the skin and wondering how they were ever going to get home like this. There were people who didn’t come at all, who were just passing through on their way to somewhere Important. Who tried to be too cool for school, walking past, not being drawn. But it looked like so much fun and it couldn’t hurt to stick a toe in, could it? Just to say they’d done it, that they’d been in a room. They weren’t going to get wet, not really. There were kids playing chasey between rooms and kids launching themselves up and down the library steps, picking up speed to hurl themselves into the water. 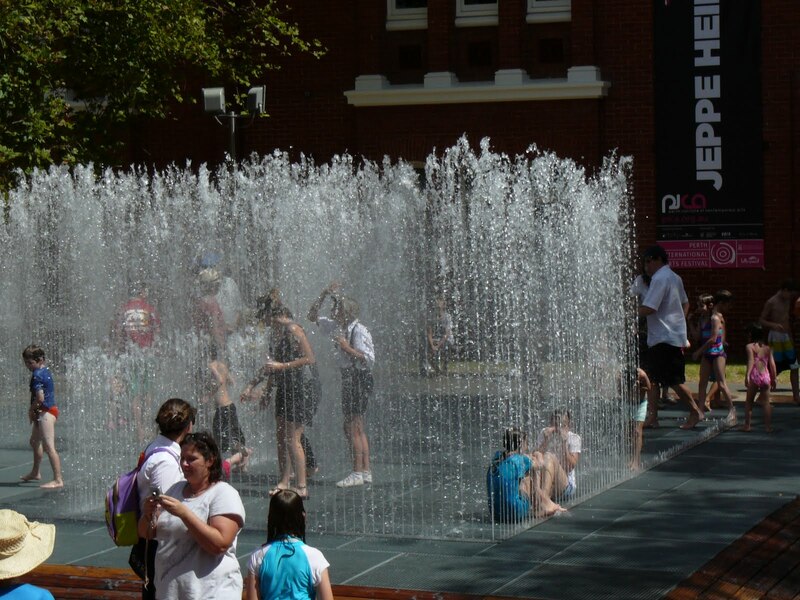 There were kids sitting quietly, playing with gentle jets of water that had popped up off to one side. There were kids sitting on wall spaces, waiting for not-at-all-gentle jets to shoot them up the bum so they could guffaw and leap up, grabbing at their shorts. 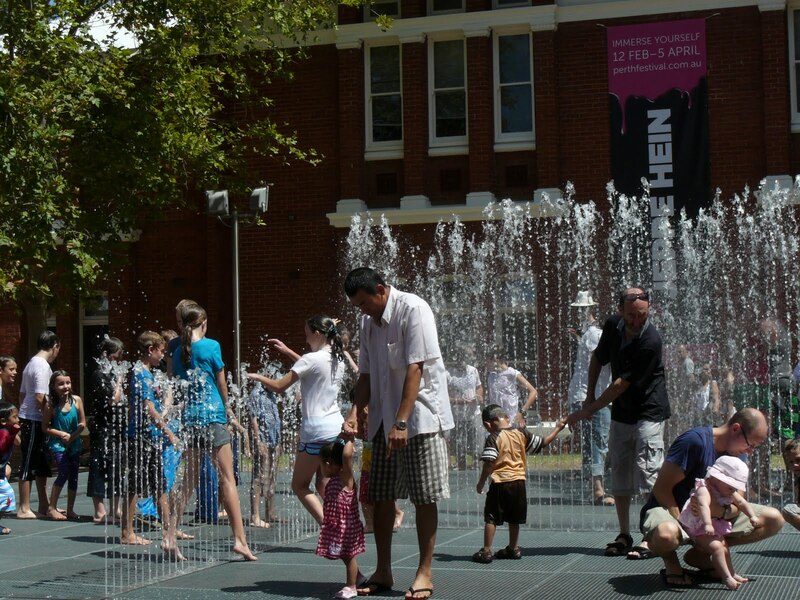 There were kids angling arms and legs into the spray just-so to deflect robust jets of water at unsuspecting adults. I saw a man in heavy black pants and a thick winter hoodie prowl the perimeter for ten minutes staring suspiciously at the water before launching himself headlong into the middle. I saw a young Maori guy run through the middle like a linebacker to catch the ball his mates had hurled over the top, ducking and weaving his way seamlessly through the water, and the crowd. I saw a herd of shirtless bogan youths stop dead in their tracks, their features coming the closest they may ever do to registering unfettered delight. Surely this is what their naked torsos had been waiting for all these years? I saw so many parents whose kids clearly weren’t dressed for saturation letting them get absolutely and unequivocally saturated. Great work, parents! I saw so many people sitting and standing and leaping and running and grinning their silly heads off, having the best time ever with a houseful of perfect strangers, soaked to the skin in the middle of the city. We’re going back, with towels, and possibly a change of clothes. Or perhaps not. Perhaps we’ll just pack light, catch the train in, let the chips fall where they may. Get there, if you possibly can. Take the kids. Take someone else’s kids. Go on the weekend when there are lots of other people around. Appearing Rooms runs Fri 12 Feb-Mon 5 April, 11am until evening. Hein’s exhibition continues inside PICA as well; I recommend going in there first before you get too wet. This entry was posted in Uncategorized and tagged dash of random on February 15, 2010 by Meg McKinlay. On a day like today, that looks like heaven! When were you there, Meg? We went on Sunday! Mum let me get really wet and then I had to walk around in my clothes. It was cool. From Sophie (I saw you in Mandurah. I finished the reading Challenge and Mum put my entry in. I liked your talk). Hey, Sophie. We were there on Sunday too! Maybe we got wet together without realising it! Thanks for coming to see me in Mandurah. I had a great time there. Good on you for getting your entry in. We almost missed ours (our local library decided they would stop accepting entries five days before the official deadline…) but managed to get there in the end. Which is bad news for you, because as I said, that Broome trip is all mine! Kate, I have a feeling it will be absolutely packed this weekend! Don't you just love it when the forecast is for “39; possible thunderstorms”? Laura, come on over. そんなに遠くはないでしょう! See, I'm practising! My kanji is woeful though – you're probably going to have to read street signs for me, you know.